Be still my cherry chocolate loving heart! This Black Forest Cheesecake is a decadently creamy, dark chocolate cheesecake topped with cherry pie filling, sweetened whipped cream, and chocolate curls. 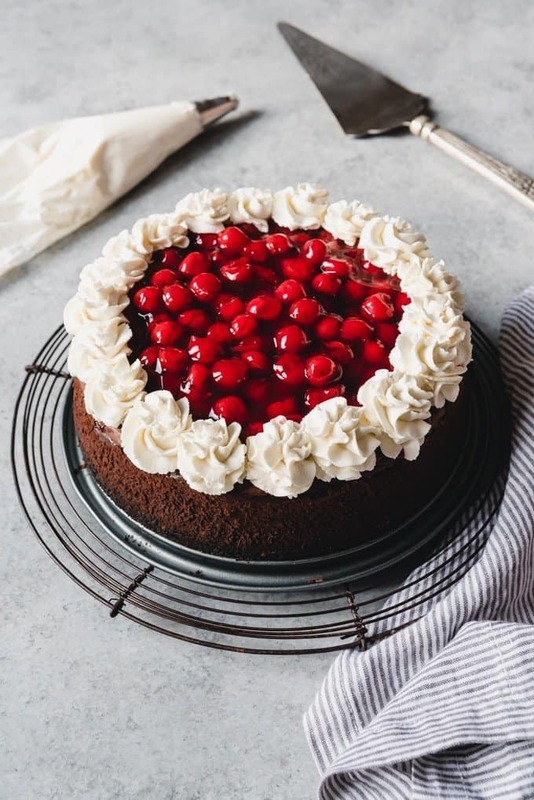 This black forest cheesecake beauty is perfect for Christmas, Valentine’s Day or any holiday or celebration throughout the year! My mom and dad were out here visiting when I made this cheesecake. 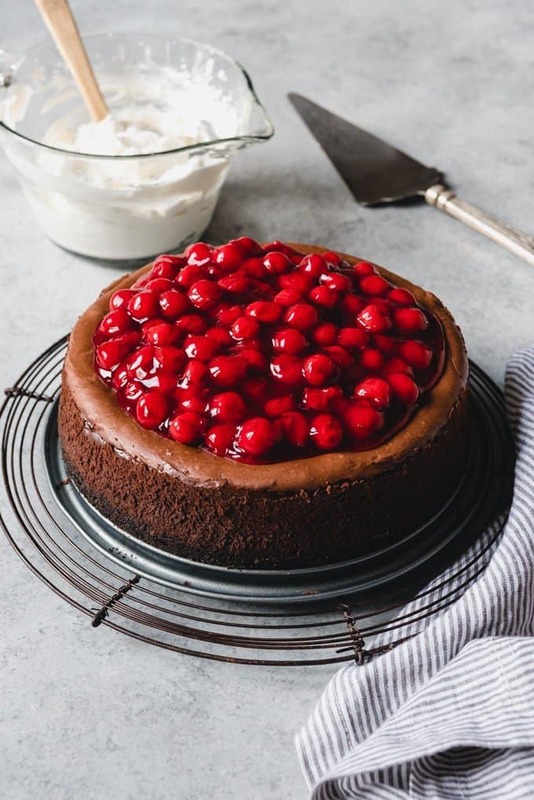 I love making something special like a cheesecake when we have guests or visitors, and since I know my mom loves cheesecake and fruit desserts and my dad loves chocolate, a black forest cheesecake was a win-win! Ever since I was a little girl I have loved the combination of cherries and chocolate. I used to get boxes of cherry cordials on Christmas morning in my stocking. My traditional birthday cake is a black forest cake. I just can’t resist the allure of decadent chocolate and sweet-tart cherries together. This black forest cheesecake is no exception. The rich, smooth chocolate cheesecake baked onto a chocolate cookie crust is to-die-for good. And it’s a lot easier to make than you might think. I spent ages being intimidated by cheesecakes. Pie crust? No problem. Macarons? I could do that. But cheesecake made me feel insecure about my baking abilities for some reason! What if it cracked on top? Do I have to do a water bath? (I’ve failed miserably at water baths on multiple occasions, ending up with cheesecake with a soggy crust, so I’m always a little gun-shy about that technique.) I’ve heard overmixing causes problems but how do you get cream cheese smooth otherwise?! I’m here to tell you that you do NOT have to do a water bath in order to get a perfectly wonderful cheesecake with incredible texture and a smooth, beautiful top that does not crack. And overmixing is not an issue until you start adding the eggs. 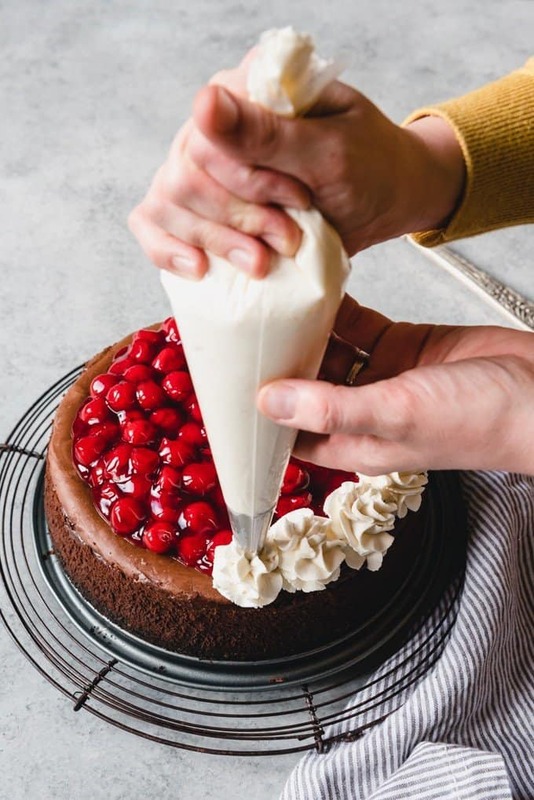 Even if you are still worried about your cheesecake cracking, the good news is that at least with a black forest cheesecake you are going to pile gorgeous, ruby red cherry pie filling on top and can cover up any cracks. Trust me, no one will be the wiser. These are the main causes behind cracked cheesecakes that I have found both from research and personal experience. Start with room temperature ingredients. You are going to be beating quite a bit of cream cheese and if it cold, it’s going to be very difficult to get it smooth. A lumpy, undermixed cheesecake batter is much more likely to result in cracks on top when baking. The eggs should also be at room temperature so they mix in better. Don’t overmix the batter once you add the eggs. 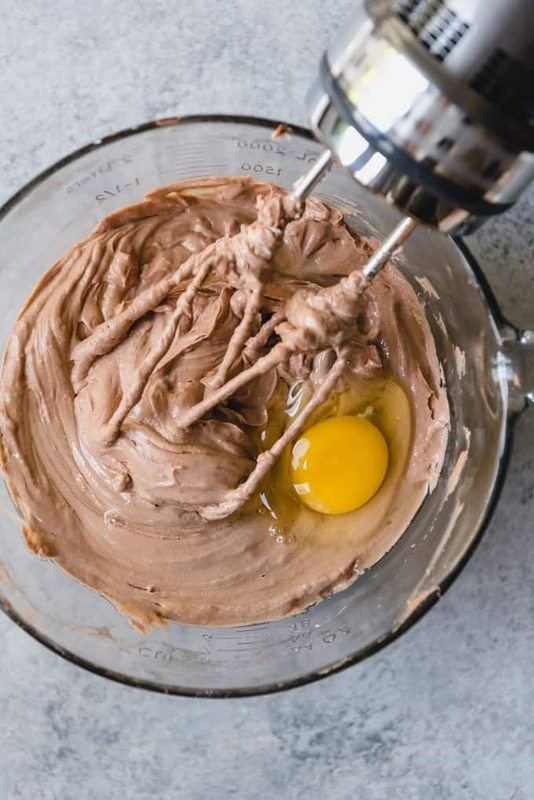 Definitely beat the cream cheese and sugar as much as needed until the batter is smooth and homogenous, but once you add the eggs, overmixing will add air to the batter, which increases the likelihood of cracks. Use a springform pan. If you bake your cheesecake in a regular cake pan, it’s going to be next to impossible to get it out to serve without it cracking. 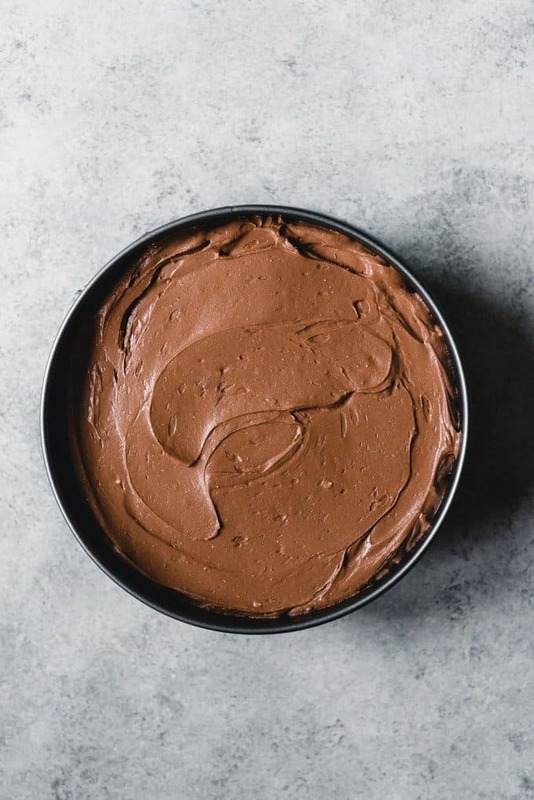 Cheesecake is much denser than other types of cake, and a springform pan is perfect for cheesecake because the sides release so that it is easy to remove the cheesecake after it cools completely. I use a 9-inch springform pan for this cheesecake recipe. Don’t peek while the cheesecake is baking! 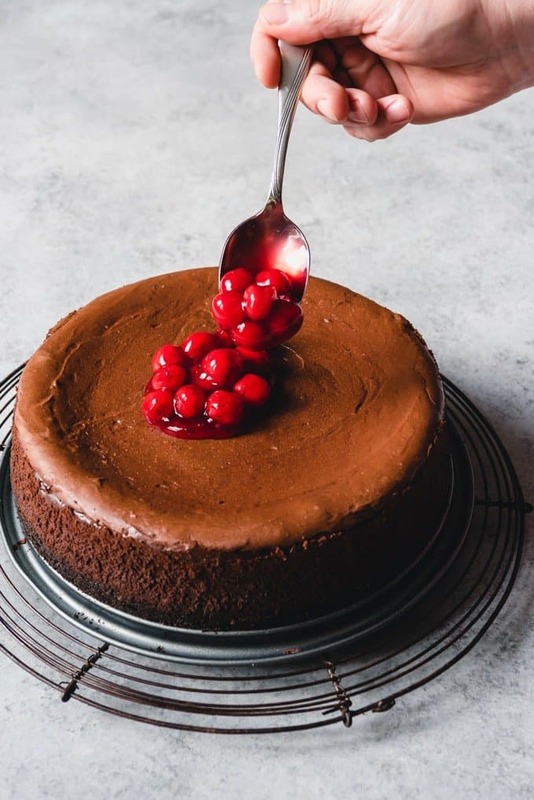 It’s tempting to open the oven door to check on the cheesecake while it bakes, but this can also lead to cracks in your cheesecake, especially if the temperature in your house is cool, as cheesecakes are sensitive to fluctuations in temperature while baking. Cool the cheesecake slowly. Once my cheesecake is done, I like to turn off the oven and crack the door for at least 10 minutes and up to 1 hour without removing the cheesecake. This gives time for the just-baked cheesecake to cool slowly and adjust to the temperature of the room rather than shocking it with a dramatic temperature difference. Run a sharp knife around the edge of the pan before the cheesecake has cooled off. The cheesecake will end up contracting in on itself a bit as it cools and if the sides are stuck to the pan there is a good chance that it could cause a crack to appear. Just grab a paring knife and swipe it around the inside ring of the springform pan to loosen the cheesecake while it is still hot from the oven. This also makes it easier to release the cheesecake from the pan later on. Once the cheesecake is room temperature, cover with plastic wrap and chill in the fridge for 4-6 hours or overnight. HOW CAN YOU TELL IF YOUR CHEESECAKE IS DONE? This is one of the trickiest parts about cooking cheesecake for me. There isn’t a simple test like with regular cake where you just insert a toothpick into the center and see if it comes out clean. The best way to know if your cheesecake is to give it a little shake. The cheesecake is done when the outer edges are firm but about 2 to 3 inches of the center is still wobbly. Remember, you are going to cool your cheesecake slowly in an already warm oven and the residual temperature of the cheesecake is also going to continue to cook it. And then it will be chilled well before serving which will also firm things up. And even though I’ve already mentioned it, it’s worth saying again even if your cheesecake DOES crack, you can always top it with fruit and whipped cream and no one will be the wiser! The first step is to make your cookie crust. 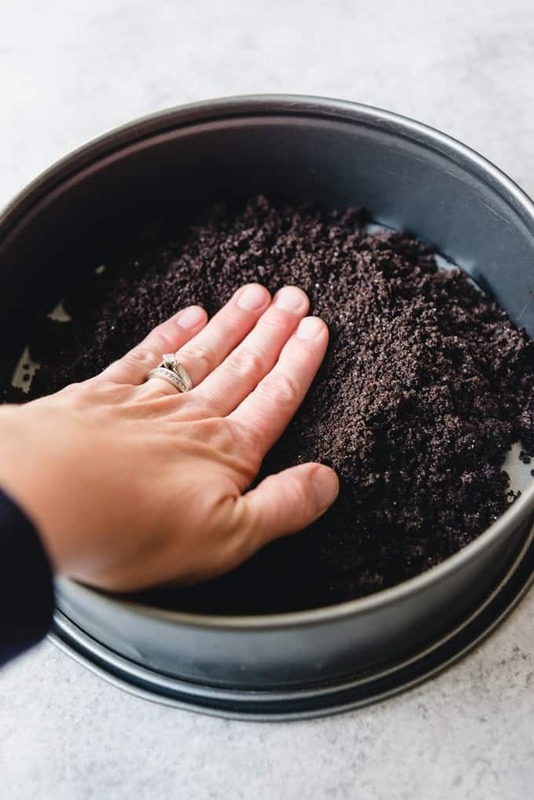 Just pulse a bunch of chocolate sandwich cookies, creme filling and all, in a food processor (or take the old-fashioned approach and bash them in a plastic bag with a rolling pin), then mix them with a little sugar and butter and press them into the bottom of a 9-inch springform pan. I always bake my cookie crusts for 5 minutes, just to set them. Next, make the cheesecake filling by melting some high-quality chopped bittersweet chocolate. You could use semisweet chocolate, which is slightly sweeter than bittersweet, if you prefer, but I think the darker chocolate flavor of the bittersweet chocolate is a better contrast against the sweet cherries that are going to go on top of the finished cheesecake. 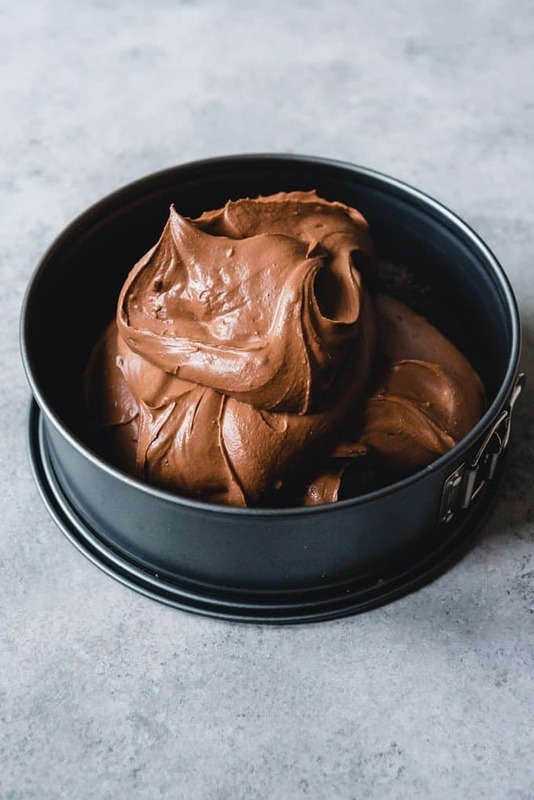 Set the melted chocolate aside to cool slightly while you blend the cream cheese, sugar, and cocoa powder together until smooth. Then add the eggs, one at a time. Remember, this is the point where you want to be careful not to overmix the batter. Then pour the melted chocolate over the cheesecake batter and use a rubber spatula to stir it in just until combined. 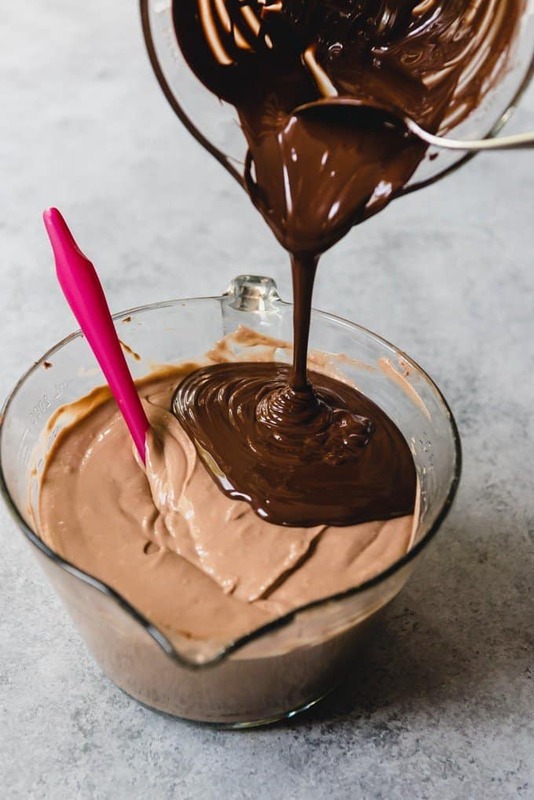 Let’s pause just a moment to drool over this picture of melted chocolate being poured into the cheesecake batter. Spread the cheesecake batter over the cooled cookie crust into an even layer, then bake for 50-60 minutes. You could use a water bath if you really want to, but I honestly think it’s an unnecessary step fraught with peril (I have PTSD from past experiences with soggy cheesecakes after a water bath seeped through my carefully wrapped foil layers). If you are confident in your water bath skills and want to use one though, go for it! Once the cheesecake has baked and had time to cool completely and chill in the fridge, top it with cherry pie filling and pipe sweetened whipped cream around the edges as a border. Garnish with chocolate curls (or chocolate shavings if you prefer) because 1. they are gorgeous, and 2. more chocolate. 2. In a large bowl, mix chocolate cookie crumbs, butter, and sugar together. Press into bottom of a 9-inch springform pan. 3. Bake crust for five minutes until set. Set aside to cool while making cheesecake. 4. Prepare cheesecake: In a medium microwave-safe bowl, melt chocolate in microwave 20-30 seconds at a time, stirring each time, until smooth. Set aside. 5. 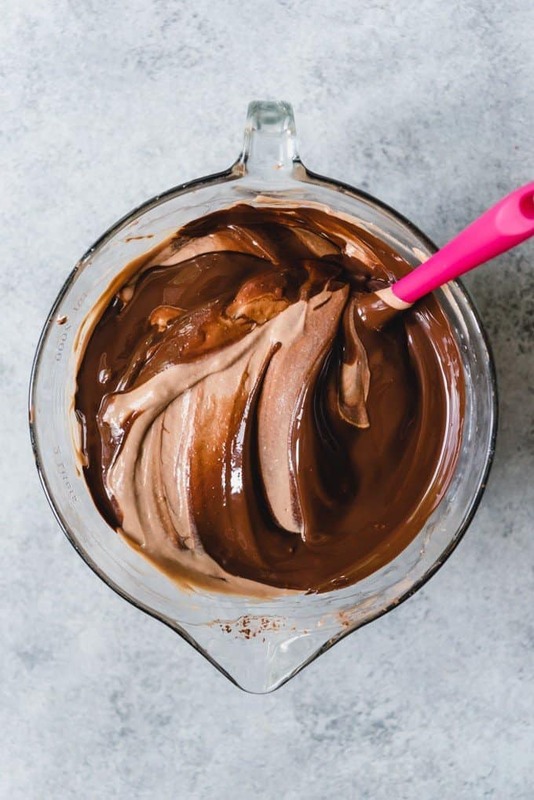 In a large bowl, mix cream cheese, sugar, cocoa powder, and vanilla using an electric mixer until smooth, scraping sides of bowl as needed. 6. Add eggs, one at a time, mixing on low speed after each addition until just mixed. Don’t overmix. 7. Mix in melted chocolate until combined. Pour cheesecake batter over crust and spread evenly. 8. Bake for 50-60 minutes or until center is almost set. The center will still jiggle while edges will be set. 9. Turn oven off and crack oven door to allow cheesecake to cool slowly for 10 minutes, then remove cheesecake and carefully run a sharp knife around rim of pan to loosen cake. 10. Allow cheesecake to cool at room temperature for at least an hour, then cover and refrigerate for six hours or overnight. 11.Decoration: Release sides of springform pan. Top chilled cheesecake with cherry pie filling, mounding cherries toward center. 12. In a medium bowl, combine cream, sugar, and vanilla and beat using an electric mixer until thick, but still soft. Transfer to a piping bag with a decorative tip. Pipe swirls around border of cheesecake.